I dined there a few weeks ago. But how to do the place justice in words? It’s a fair quandary. We’ve remained friends ever since. I jokingly refer to him as my future husband because if we did get married, our book and music collection would be fantastic. 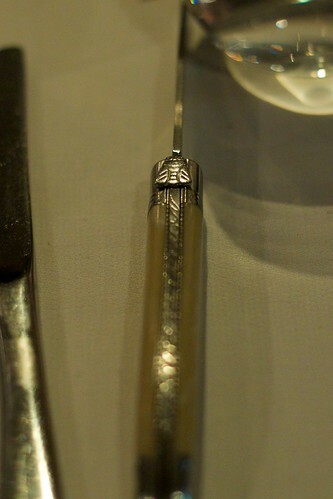 It was he who first told me of Attica’s existence and that he longed to dine there, matched wines and all. So we did it, one Friday night when only the degustation is available. What took us so long, I don’t know. When I arrived, Derek was enjoying a gin and tonic and Tris a beer. I had a gin and tonic too (for some reason, they didn’t ask me what gin I wanted and I got Bombay Sapphire, harumph. I prefer Tanqueray in G&Ts). After realising our other dining partner wasn’t going to show up, we indicated we were ready to begin and so condiments and bread appeared. 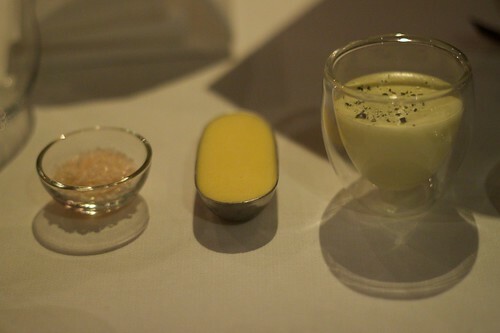 House cured butter and this olive oil emulsion which looked like it had the consistency of chocolate mousse, but was very soft and aerated. We had the choice of sourdough or rye bread to use up these curious condiments. That was just bread and condiments! The degustation proper still hadn’t begun and we were brought out a carrot appetiser. 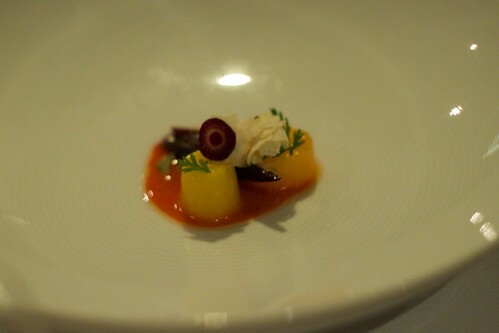 So teensy, and reminiscent of a carrot salad had at Cutler & Co’s degustation, but infinitely better. Seriously, I reiterate: this is just the appetiser, folks! 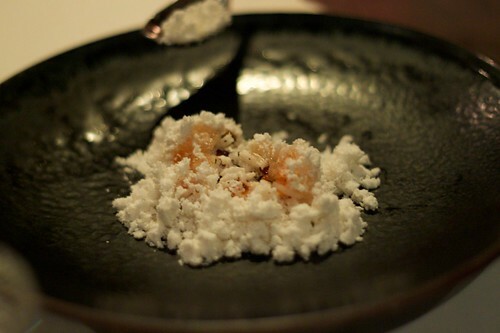 The first course in the degustation was the snow crab – imagine a pile of fluffy white ‘snow’ in front of you with crab lurking beneath. How do they make such dreamy, ethereal stuff? Derek had chosen to have the matched wines and graciously provided both myself and Tris with a sip (he did this with all the matched wines, bless his soul). The wine served with this course was the Silver Wings ‘Macedon noir’ Brut rose NV. 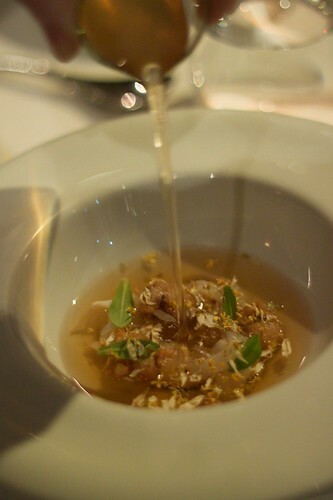 The next dish was osmanthus and chrysanthemum broth with abalone and cuttlefish. The broth is more like Chinese osmanthus and chrysanthemum tea, both of which I’ve drunk before. A very delicate floral taste. The dish is presented to you sans broth, but then poured in gently at your table from a beaker that would look at home in a chemistry lab. It was matched with a Henrique and Henriques 5 year old NV madeira. The third dish made some interesting claims with its given title – ‘a simple dish of potato cooked in the earth it was grown’. Indeed, the potato is a humble vegetable. An industry friend of mine attempted to give me ‘insider’ information on the origins of this dish (specifically, the potatoes used) but to no avail: I continue to this day to be impressed by it. Derek one-upped both Tris and I and elected to pay extra to get the Manjimup truffle supplement – two people come up to your table and hand grate the truffle over your potato in quite the vigorous manner! I was worried they’d be stingy but it was quite the opposite. 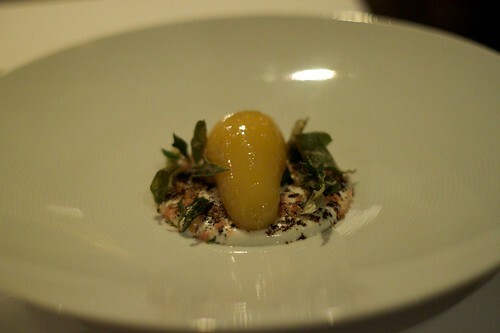 I love how the potato gleams in an almost desserty way. All three of us had a glass of the matched beverage – the Eric Bordelet poire granit cider from Normandy. It set off the earthiness and rustic appeal of the dish wonderfully. Yes, potatoes and perry sounds like an odd match, but it worked! To my (neophyte) palate, one of the hallmarks of a good chef is someone who can make you raise your eyebrow at an unusual pairing of flavours but have you on board with the first mouthful. 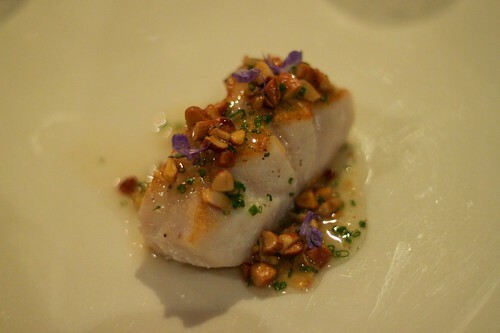 The following dish of bass groper with almond and garlic is an excellent example. Almonds, really? Not something I think of going with fish and yet, what a welcome experience, for your tastebuds to disagree with your preconceptions. For accompanying wine there was the Allies ‘Garagiste’ chardonnay 2008 vintage – possibly my favourite matching. Feed the men meat! Oh wait, here we are. 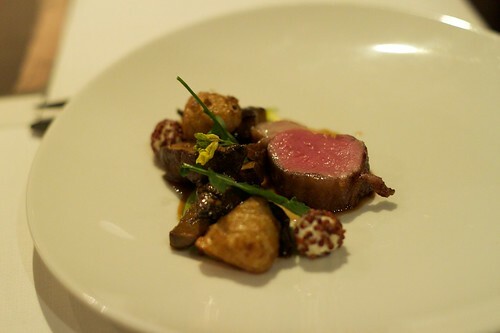 In dainty morsel-sized portions too – this was lamb and mushrooms roasted over wood with sauce of forbs. I had to check out Melbourne Gastronome’s post to find out what forbs was. I loved the mysterious balls rolled in something that seemed like toasted mustard seeds. Again, Claire’s post proved highly educational on that front too. The mushrooms were crazy and one of them I found a little odd and not quite to my liking, but the meat! Perfect. There were whispers of ‘sous-vide’ on our table. This course was matched with the Barone Ricasoli ‘Brolio’ chianti classico 2007 vintage. 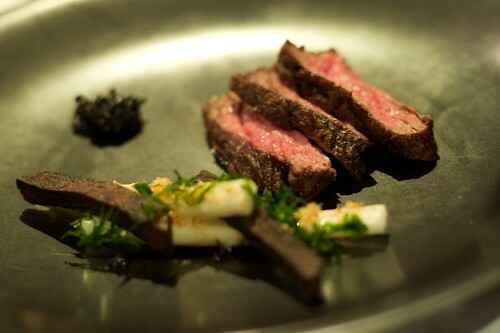 The beef, seagrass and white cabbage was not as nice – I found my meat a little chewy. The white cabbage reminded me of parsnip, oddly enough. The potato was amazing – you can see it’s almost charred black despite being cooked using different methods. This course was matched with the Enigma ‘Variations’ syrah 2007 vintage. I confess that I had absolutely no idea what terroir was – I thought it was a term used to describe the earth in which wine grapes grew? When the said dish arrived, we were all further perplexed. We were told that there was beetroot, avocado and clover. I tasted berries too. 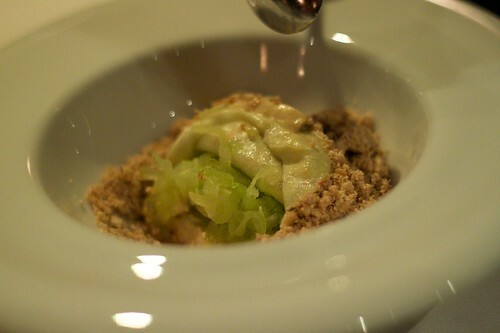 Again, another dish that tested preconceptions prior to tasting. It was such a complex mix of flavours and textures. What I remember most vividly is grassy and sour tartness with a slight savoury background. But was it ice, or soil or cake crumbs we were eating? I think it was all those things! See what lurks below! I cannot remember a thing about the Braida Brachetto 2008 vintage – my brain was too busy trying to interpret and decode things going on in my mouth! Of course when we were ready for the final dish of apple, olive and warm shredded wheat the words “ooh! An apple crumble!” came to mind. By now we had come to expect that it would definitely be out of the ordinary and were correct. I was quite starstruck when Ben Shewry, the head chef himself came out to lovingly spoon the wheat onto the apple. He told us that these crumbles of sorts use three apples each. Throughout the night, I’d found the wait staff fairly glacial which was a stark contrast to Ben and his earnestness and warmth. I wish I could have said more to him but I was far too shy. The matched alcoholic beverage was the Bernadins muscat beaumes de Venise 2008 – it smelled much sweeter than it tasted and was a polite complement. But not quite finished just yet! I got some wonderfully aromatic Earl Grey tea and the lads had coffees. 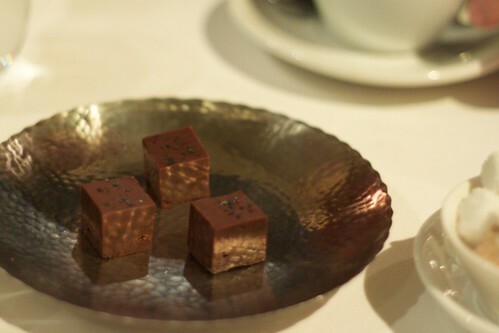 To signal the end of the meal, we were presented with decadent petits fours. Very special chocolate fudge-type things! The only reason I’m not infatuated with my experience here is the service wasn’t as polished as it could be: admittedly due to one of our party not arriving we started an hour late but there were still other diners when we were finishing up but they practically whisked us out the door brusquely (or at least, the lady attempting to help me into my jacket did). 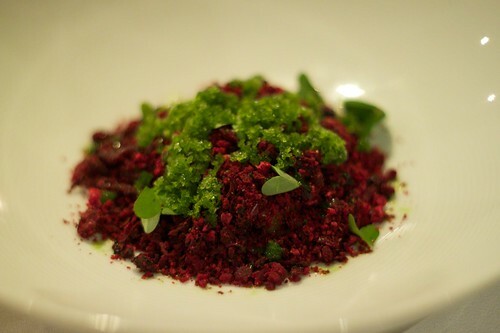 However, the food…where on earth (or at least in Melbourne!) could one go for such unique cuisine? Perhaps this is what led San Pellegrino to nominate Attica as one of its top one hundred restaurants in the world. Part of the charm and appeal of the dishes served here as part of the degustation is that they are not entirely ‘finished’ in terms of preparation when they are put before you. You either have to mix or wait for something to be sprinkled or poured before it’s truly ready. I think it helps the diner feel a little more connected to their meal and more involved. I know folks at the moment are all about edible snow because of *that* cooking show, so you have no excuse to not be hitting up this establishment. Besides, my write-up hasn’t done it justice but perhaps that’s just my evil ploy to get you to check it out yourself. This entry was posted in eatie-foodies dining out and tagged Attica, Ben Shewry, degustation, Melbourne, modern Australian cuisine, Ripponlea on August 9, 2010 by gem. Oh sigh! Swoon! What a wonderful looking meal and great looking photos to document all of it! I’m salivating over the grouper, it looks so cute with the little hints of purple on it as well, just a shame the service didn’t match the food! Yeah, me too, it was really pretty. Oh so pretty and oh so edible! Great! I am very much looking forward to my booking in Sept. YUM! It’s just so colourful! Can’t wait till I go. I also think the Tuesday night experimental night would be interesting as well. I think the experimental nights might be a tad cheaper too? I’ll have to confirm with my friend who’s been. I am glad you enjoyed Attica.I have a few times now and each visit it’s seems that they keep growing and growing talent and vision.It’s a shame about the service though because I felt that the service was on par or better then Vue de monde which I regard as fantastic.I have to say though I am very jealous of your option of truffle with the potato dish I can only imagine how well that would of worked. I didn’t actually get to try the truffle – though my friend Derek was extremely gracious and offered us some 🙂 as you can well imagine, the scent was just glorious. Probably not for a while, but have decided I shall save to do it all over again, vegetarian! I’ve also heard great things about Tues experimental nights too. Good write up, Gem! And lovely photos, Tristan. I haven’t eaten here, but I need to rectify that soon!